On October 05 2009, I was once again saddened by the death of someone I have never met and who doesn't even know I exist. When I ventured into the path less traveled on October 2008, I started seeking mentors and people who would help me succeed. 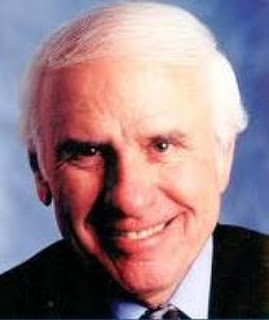 One of the few people who caught my attention was, Jim Rohn. For more than 40 years, Jim Rohn has shaped the lives of many people and expanded their imagination of what is possible. He is widely regarded as one of the most influential thinkers of our time. Jim Rohn was born in Idaho in the mid 1900s. Het met his mentor Earl Shoaff at the age of 25 and a few years later, he made his first fortune. However, he remained discreet until he moved to Beveley Hills California, when he was asked to tell his success story. He entilted his success story - "Idaho Farm Boy Makes It to Beverly Hills." He made a successful speech and thereafter, he received invitations to share his story and he started getting paid for it. From sharing his story to small audiences, he started being guest speaker in seminars in 1963. This propelled him into the limelight and he has since then impacted millions of people (including me). Take special care of the inner circle - family, close friends. Nourish them, they'll noursih you, inspire them, they'll inspire you. If you'll change, everything will change for you. We get paid for bringing valuse to the market place. Profits are better than wages. Wages make you a living, profits make you a fortune. Jim Rohn always left his audience with these words: "I go with you in all the experience that we've had. But I promise you this as we leave here: I will not leave you behind. I'll take you with me in my thoughts and in my heart." May the legend - Jim Rohn rest in peace.